Our 2015 DoveTales, an International Journal of the Arts, “Nature” Edition is now available for purchase! The “Nature” edition is our largest undertaking to date, with 82 wonderful contributors, plus our nine Young Writers Contest Winners from 2014. The book is 398 glorious pages. Special thanks goes to Colgate University Research Council for their generous sponsorship. 2015 winning entries will be published in our 2016 DoveTales. Participation Certificates and Awards will be sent out next week. Be sure to watch our blog and Facebook page to learn more about these talented young writers, and what our judges had to say about their work. We would like to thank our prestigious panel of judges: Antonya Nelson, fiction; Steve Almond, Nonfiction; Stephen Kuusisto, poetry. 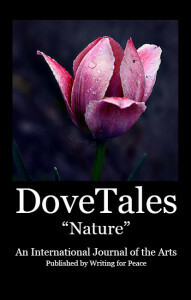 This entry was posted in Contests and tagged 2015 Contest Winners, DoveTales, Nature. Bookmark the permalink. Thank you for this beautiful book! I can hardly wait to get my copy!